Happy New Year everyone! We have just bid farewell to the old year and welcomed in 2016, a new year with the prospect of new beginnings. Some people look on this as a good time to make changes in their lives and make new year resolutions. We are one week into the new year and I wonder how many of us are still sticking to those resolutions. Did anyone even make resolutions this year? I decided I must go for a walk every day. I gave up making a lot of new year resolutions a long time ago because I found it was pointless. The momentum only lasted a few days and then I found myself making excuses not to keep them, so this year I decided I would just have one goal and try to stick with it. Will I keep my resolve and keep going for my walk? So far so good but it is very cold and wintry at the moment. If I feel like not going out, I tell myself walking is good for my health and a bit of cold weather never harmed anybody. So far this tactic has worked for me. It is a matter of mind over matter. 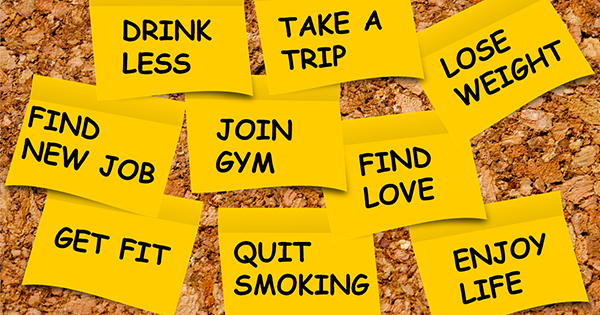 The usual resolutions people make at this time of the year are to lose weight, give up smoking, exercise more and to aim for a healthier lifestyle, to name but a few. They are made with good intentions but sometimes events can overtake them and they fall by the wayside. But why do we do this to ourselves? Perhaps because it is a new year and we feel it is a good time to change our old habits to what we perceive as new and better ones, but this is easier said than done. For example, giving up cigarettes sounds great in theory but to put into practice is a very different matter. The nicotine cravings set in after a few days and this can not only affect ourselves, but everyone around us as well, because we may become moody and hard to live with. Can I make a suggestion that may help with giving up the habit? Instead of giving them up all at once, maybe it would be better to do it on a phased basis, perhaps smoking one or two less every day until it is down to a manageable amount, or better still, to when you give them up altogether. The task will not be so overwhelming to begin with and will feel less stressful. Take it just one day at a time. This is very easy for me to suggest when I do not smoke, but I did smoke one time so I do understand how hard it can be. Is the suggestion worth a try at least and who knows, it might just work. I want to wish each and every one a very happy and healthy new year and hope all that you wish for comes true. If you feel you need help, don’t be afraid to ask for it. Please feel free to give Cara Counselling a call on 083 1855958, or you can also use the Contact Me page and I will get in touch with you as soon as possible.